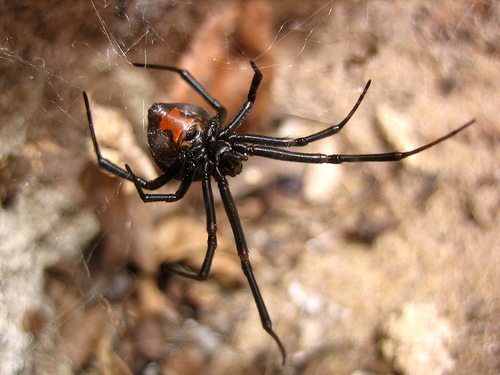 The Redback spider is a dangerous spider that resembles and is related to the infamous black widow spider. It is a family member of the genus Latroduectus which can be found throughout the world. The female spider is easily recognized by its distinctive red stripe on the upper side of its abdomen. The female has a round body length of about a centimeter with long and slim legs. While male is smaller where its length is only about three to four millimeters long and the body is light brown in color with white marking on the upper side of stomach. The Redback spider web is not organized with irregular tangle of fine but has strong silk. The spider and its egg sacs are normally found in the spider web which forms like a funnel-like retreat area. This rear potion of web has a vertical with sticky catching threads that run to ground attachments. It usually preys on small insects and sometimes they can capture larger animals that become entangled in their web such as trapdoor spiders, small lizards and king crickets. Generally prey stealing occurs where larger females take food items that stored in other spiders’ webs. 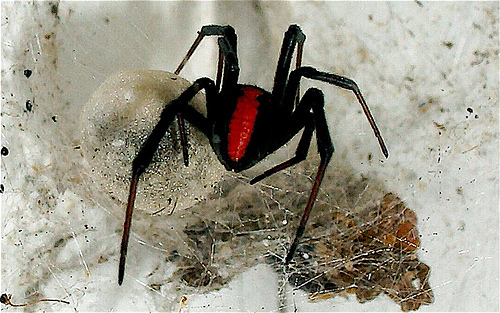 The female redback spider matures in 60 to 325 days while male spiders mature in 37 to 167 days. The males’ lifespan between six to seven months while female may live up to three years. Redback spiders can survive without food for an average of 100 days! The male Redback spider is actively assist the female in sexual cannibalism. Males sacrifice themselves during mating present two advantages. While mating, the much smaller male spider somersaults to place his own abdomen over the female’s mouthparts. Males who are eaten are able to have sexual relationship for a longer period and thus fertilize more eggs. In some cases, the female consumes the male while mating continues. Female spiders who have eaten a male are more likely to reject the subsequent males. Males who are not eaten die soon after mating. Some male redback spiders sometimes use an alternative tactic in order to ensure that more of their genetic material is passed on. 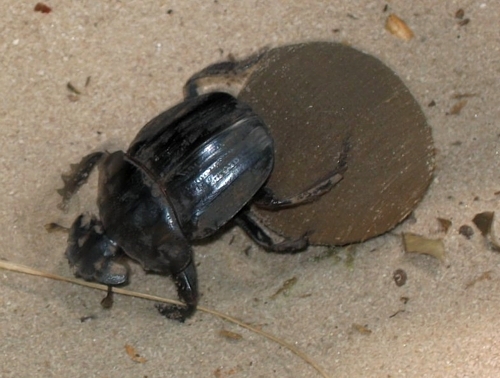 Males will bite through the exoskeleton and deliver its sperm to the organs of younger female Redbacks who are nearing their final molting without performing the somersault mating. Within a few days after molting, the females deliver a normal clutch of eggs. After female spider has mated, she can keep the sperm and utilize it over a period of time up to two years to deliver several clutches of eggs. A female spider can lay eggs on every 25 to 30 days and the eggs hatch between 13 to 15 days. Young Redback spiders will leave their maternal web by being carried on the wind and in order to do this the spider has to extend its body high in the air and then produces a droplet of silk. This liquid silk is pulled out into a long string that brings the spider away and thereafter will create its own web at another spot. Black widow spiders are super scary. I just hope I never get bit by one! Me too! They are really scary found anywhere… it’s common to see them in your backyard, in the shed, or elsewhere. Yikes!